David Groat, Principal, KES, presents a certificate to the 1st place winner Gina Wilcox. Amber Dumond, Sarah Dorosky, Col. Jason Edwards, Dana Tiller, Jennifer Hahn (left to right). Kaiserslautern Elementary School had their Spelling Bee at the KES MPR, Jan. 31. 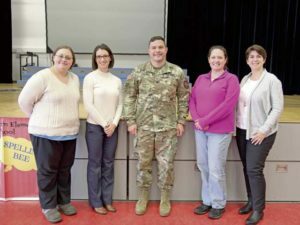 Col. Jason Edwards, Com­man­der, U.S. Army Garrison Rheinland-Pfalz, fulfilled the role of pronouncer. Judges were Sarah Dorosky (School Liaison Officer), Jennifer Hahn (School Liaison Officer), Amber Dumond (KES Educational Technologist), and Dana Tiller (KES Counselor). Second place winner is 4th grader Raaj Chavez. 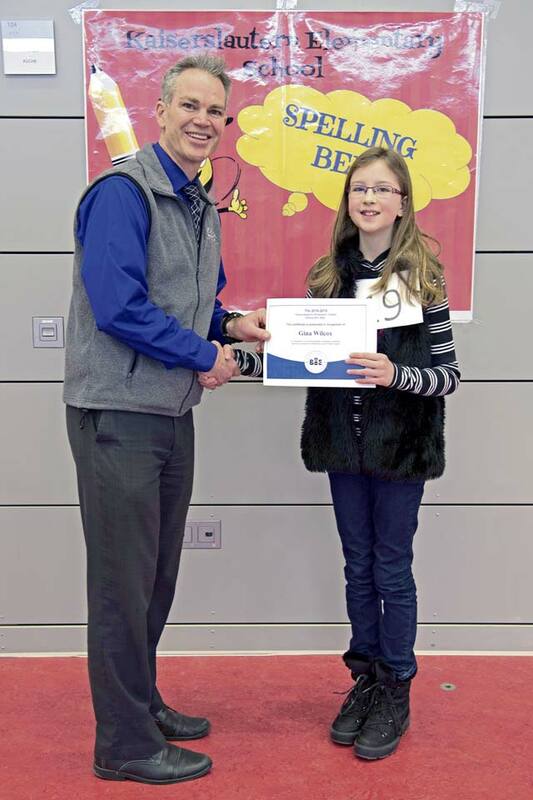 First place winner is 5th grader Gina Wilcox, who will represent KES at the regional spelling competition at Ramstein Elementary School on Feb. 23.